OMG the santa mouse is so sweet! Make one for me, too, will you? Am I #2 to comment?!!? Love your mousies! Santa Mouse is wonderful. Hope you get a chance to relax a bit this weekend. A nice addition to the day that the delightful Christmas Mouse appears could be a copy of Beatrix Potter’s poem “Three Little Mice Sat Down to Spin” or an introduction to the longer story of The Tailor of Gloucester. Squeee… That mouse is delightful… Perfect for the Advent calendar. I’m impressed with your ability to just make pink ear yarn appear. As always, you male things look so simple and straightforward, it gives a gal confidence! I bet the cat is hoping for one for Christmas, stuffed with catnip! You are very resourceful, making a tiny bit of pink mouse ear yarn! I am in love with Santa Mouse! You’re off to a good start, and I hope the parade continues. This calendar will be cherished. The mouse and rainbow a too, too sweet. You are so clever and with your schedule I do not know how you do it all. I meant to comment yesterday to say Susan B. Andersons http://www.ravelry.com/patterns/library/butterfly–cocoon or Flower Fairy & Leaf Sprite are beyond precious and I think could be worked up in holiday colors. Lucky kids, wonderful auntie. Oh my gosh, totally blushing right now (no fault of the half-glass of wine I had after putting the kids to bed). 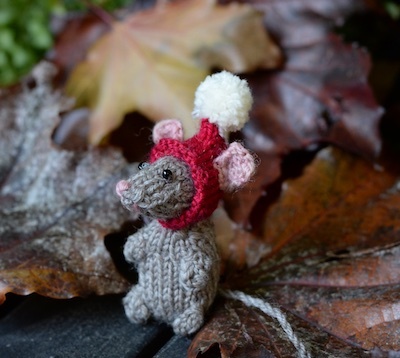 I’ve been reading your blog almost since I started knitting, and you actually made a mouse from my pattern! Please forgive the slight knitting-celebrity crush. I’m so happy you liked the pattern, and enjoyed the result. I can’t wait to see what you make next. I agree a reindeer would be perfect. I’m working on the mouse now. I’m so glad you liked my suggestion, I’m feeling a reflected brush with fame. 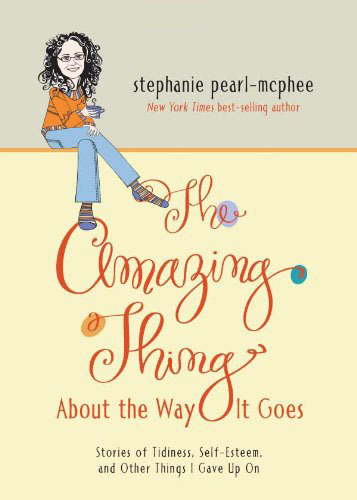 Steph- it would be easier to follow along if you hinted ahead. I’ve already pledged that this year any Christmas mice ornaments are staying in the box or getting donated. Mice are not cute, they are a nuisance. I just caught two in my kitchen. They did not follow the rules that I had laid down, they weren’t decent enough to stay in the garage, the rodents actually violated our food preparation space. Nope, no Christmas mice here, not this year, anyhow… however, I suppose a week or so ago (before hearing mouse noises in kitchen) I might have found your mouse quite endearing. Hmmmm… why not knit a Christmas squirrel? I had a similar problem quite a while back with an occasional mouse appearing in the basement. I kept sealing & insulating until I found a sizeable hole left by utility workers, likely many years ago. No unwelcome visitors since then. Oh my gosh, those are as cute as a bug’s ear! Loooove the Santa Mouse and rainbow! Thank you for sharing the rainbow instructions. 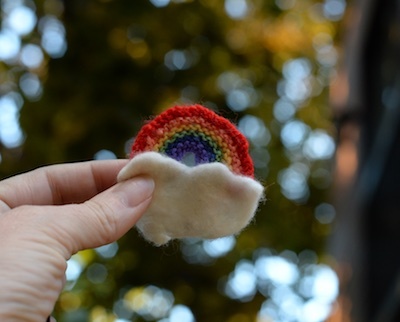 I think it might just be the perfect little ornament for the rainbow I’m baking for the next next 3 – 5 weeks. Absolutely fabulous I simple love Santa Mouse so squeat. I started reading this blog when you were making an advent calendar for Luis. It was later in November, and things weren’t going so well. Yarn Harlot, I though you were nuts. Now…I knit all the time, through meetings, at bars, while watching anything. I learned to spin. I have a yarn stash, I just scoured a fleece last weekend. So maybe I’m nuts too, now, but I am so excited that you are making another advent calendar. It’s sort of a benchmark for me to see my old self by and wave at her through a fuzzy haze of wool. And I do have all the colors I need upstairs to make this wee mousie! Does anyone happen to know where the Santa pattern on Luis’ calendar came from? The 2014 November archive only showed a few if the month’s posts, with no option to go to older. I am going to scroll through December 2014 (that will let me view older posts) but somehow think the pattern link was more likely found in November. Planning for a calendar for my wee niece Evie for next year! 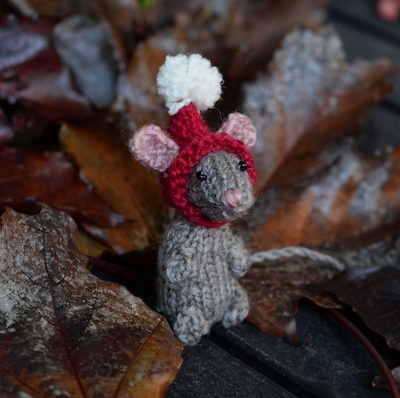 I cannot believe this…..over the summer I knit 32 Santa mouses (mice) for Christmas gifts. I love the fact that The Yarn Harlot and I are knitting the same thing. Your Advent Calenders are a work of love and art. This year im making a grey tabby cat in honor of our own kitten we got last year. But, I just want to say you inspired me to get a head start on Christmas and I have 6 hats completed! I am going to knit a few extra and let them choose their own. We shall see how that turns out. May I sugest a wool pig? It was long enough ago, that I can’t remember who made that accusation, but it stuck with me. Argh that mouse is too too good! I loved your calendar last year and am (selfishly) so pleased you’re making another one – looking forward to seeing the next 21 tiny things! Oh, I love Santa Mouse! Still have the original book that my mom gave to me on my first Christmas as a 7 month old in 1975! I did not think to put a pompom on and make them Santas, though. Super cute! Oh love the mouse. Santa Mouse was my daughter’s favorite book. We had a little mouse, and put a tiny package in the tree every year for her to find. That was her gift from Santa Mouse. Also, we had to put out cookies and milk for Santa, along with a piece of cheese for you know who. Thanks for making me remember all that. That mouse is absolutely adorable! Those are so sweet! For Myrie, I’m assuming? I love the way you thought up that rainbow. It’s absolutely charming! Suddenly thinking I need to make an advent afghan Right Now for my granddaughter who will be two Christmas Eve. Knit pockets all over it. Stuff them with rainbows and cute mice. See what you just did there? I love your mouse! So cute! I have a question can you share how you organize your knitting? Your seamless with lineing up projects. For example do you attach patterns to yarn in plastic bags? Or keep a list? Now, why am I not surprised that you didn’t have any pink yarn? So clever of you to dye some rather than using it as an excuse to go yarn shopping! Santa Mouse was a Christmas staple in my childhood, so much so that I had to find the book used on Amazon so I could read it to my kids (Mom wouldn’t give up her copy). Oh that mouse is just too cute! So precious, although I have to say I’m glad it’s you and not me knitting a Christmas advent calendar, the pieces are beautiful but I’m sure I’d be stark raving made by the end of the month. Love your little pieces so far for your advent calendar. If you are looking for a couple of other happy ideas, the Wee Jolly Elf by Churchmouse Yarns knits up quick and adorable. I made several last year (including a couple in red with an improvised garter stitch beard that looked like THE Jolly Elf himself) as hostess gifts for Yuletide outings. I also made several gift box tags from the Bluebird of Happiness pattern. Again, a very quick knit that brings a smile. I love the little rainbow! Thank you for the brief pattern/instructions! SANTA MOUSE was a huge favorite with my kids too…..I must find a copy for the grandson before he outgrows my lap! Santa Mouse looks a lot like Chris Mouse I made for my husband’s grandmother back in the 90’s. Only difference was size and the strand of tangled tree lights. I’m jealous of your dedication. I need to get some of that so I can finish my projected gifts, advent calendar scarves for the women in my family done in a variety of colors and weights. Long-time reader, first-time poster — the Santa Mouse actually made me squeal a little bit! Thanks for sharing the tiny adorables with us.